Today, The Weekend Gourmet is staging a #Weinervention! People, it’s time to change the way you eat hot dogs...so I’m partnering with Applegate to show you a healthier way to enjoy this American classic. A recent survey found that a whopping 92% of Americans bought hot dogs in the last year -- but 80% agreed that most hot dogs are low quality and unhealthy. 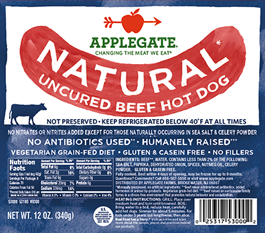 When it comes to hot dogs, Applegate believes that it’s time for a “cleaner wiener.” More than 90% of people who eat hot dogs say they would rather purchase hot dogs with a short ingredient list, and that’s where Applegate steps in. The ingredient list for their hot dogs is simple: antibiotic and hormone-free beef, water, salt, and spices. That’s it, folks…no funky additives, preservatives, or mystery meat to be found! Last weekend, I staged my own personal #Weinervention. I served my Applegate Natural Uncured Beef Hot Dogs two different ways: what I like to call Ballpark Style (with mustard, ketchup, relish, and diced onion) and Texas Style (with mustard, chili, and cheese). Michael absolutely loves chili dogs, so I knew that they had to be one of my menu options. For this occasion, I decided to step my game up a bit and make a healthier homemade chili topping. What I came up with was super-easy Slow Cooker Hot Dog Chili. It features lean ground beef, organic tomatoes, onions, and a few herbs and spices. Simply set this chili to cook in the morning, and you’re good to go by late afternoon/early evening. 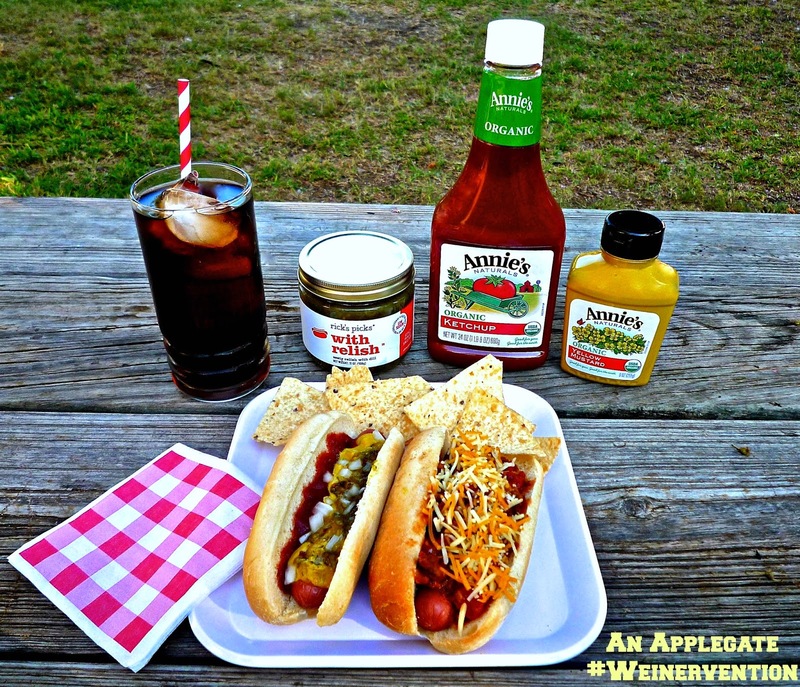 That makes this hot dog topper perfect for back-to-school dinners...or Fall weekend football-watching parties! Step 1: Preheat slow cooker on Low for 10 minutes. While the slow cooker heats, brown the ground beef/turkey with the garlic. Add salt & pepper to taste. Add the browned ground beef/turkey to the slow cooker. [NOTE: My slow cooker has a non-stick insert and a function that allows me to brown meat directly in the slow cooker.] Add the onion, hot sauce, chile paste, and tomato paste. Stir well to combine. Finally, add the coriander, cumin, cilantro, and chili powder. Stir well to evenly combine ingredients. Step 2: Add the diced tomatoes (juice and all) and water. Stir to thoroughly combine all ingredients. Taste and add more salt & pepper if needed. Cook the chili on Low for 6 hours or on High for 3 hours. It's tempting, but resist the urge to remove the lid during the cooking process. This ensures even cooking and a better end result. Step 3: When the chili is cooked, it should be thick and hearty so your hot dogs aren’t soggy. Spread 1-2 tbs. of the finished chili on top of each hot dog and top with your favorite cheese – I prefer 2% cheddar-jack. This recipe makes enough chili to top at least 10 hot dogs. This flavorful chili worked perfectly for my chili dogs! It’s thick enough to top the hot dogs without making them a soggy mess, and it’s got a spicy kick. It’s more of a slow burn than in-your-face heat. Any leftover chili is great for making quick Frito Pie: simply top Fritos with the hot chili, shredded cheese, and finely diced onion. Everyone who tried the chili enjoyed it…and I liked knowing that it contained simple, healthy ingredients that fit in great with my Weinervention theme. Everyone also raved about the flavor of the Appelgate hot dogs. They had a nice snap when we bit into them, and they were savory and delicious. I felt really good knowing that they not only tasted good…they were better for my guests! When the preservatives are removed, the natural flavor of the beef shines through perfectly in these hotdogs. I call that a resounding Weinervention success! To find Applegate hotdogs at a store near you, visit their handy online Store Locator. Disclosure: Applegate provided me with a #Weinervention kit and a gift card to facilitate this feature. All opinions expressed about the product are mine.